Greg Howard/Photo / Mark Mitchell Greg Howard, director of Planet Green, a Kapiti Coast New Zealand company, has signed a a deal with a Global sportswear giant Fila, for a licencing agreement covering the South Pacific. Greg said the deal was massive and could see his company selling up to 300,000 gloves under the Fila brand in the region annually within the next three years. The company already sells the gloves in the United States under the Fila Golf brand, and said one possum skin went into each glove, he is excited about the new deal; " Because Fila now own Acushnet golf , through a recent acquisition, they now own the Footjoy, Titleist and Pinnacle brands. That really covers every top golfer in the world, any of those golfers could be wearing the glove next year. Because of the success of the possum fur blend with wool, used in clothing, and the growth of that industry, there's plenty of skins. We spent two years getting the tanning process right to provide an amazing grip. The grip works in the dry or in the rain. Once this South Pacific deal is going we've got the whole of Europe as well, but we have to get this going first." 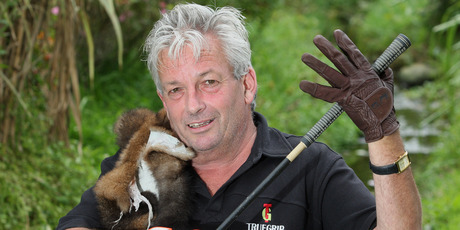 Green Planet Director Greg Howard White Dragon Golf is also a Kapiti Coast business, and you can be sure I will be asking Greg about his amazing deal with Fila.